Suspensful and edgy 24 follows counter-terrorism agent Jack Bauer as he tries to save the country week after week, all in real time. Jack battles foreign and domestic enemies every week. Each season encompasses an actual day, and each of the 24 episodes in a season showcase an hour in the day of battle. The men of 24 have included Kiefer Sutherland as Jack Bauer, Carlos Bernard as Tony Almeida, Eric Balfour as Milo and Dennis Haysbert as David Palmer, among others. 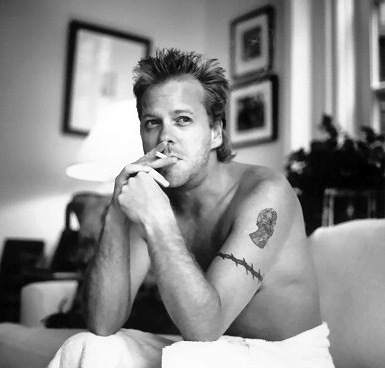 24 ended its TV run last night, so we thought we’d go out with one of our favorite shirtless Kiefer Sutherland pics! Kiefer Sutherland often plays a straight-arrow type of role like that of Jack Bauer on 24, but off screen he’s anything but. The 24 actor is notorious for his drinking and partying, and has picked up some DUIs to prove it. Carlos Bernard knows a good thing when he finds it. He got his acting start with a role in The Killing Jar in 1997, did some guest spots here and there on various shows, but found a home just 4 years later as Tony Almeida on 24 and has stayed with it for 9 years. There’s some doubt, though, as to whether or not Tony Almeida will be around much longer on 24. Kiefer Sutherland, son of Donald Sutherland, plays Jack Bauer on “24.” After a couple of decades on the big screen including hits like The Lost Boys, Stand By Me, Flatliners, A Few Good Men and Young Guns, this is his first regular TV role. Kiefer has a twin sister, younger by 7 minutes, Rachel Sutherland. Aside from acting, he was once competitive in rodeos and plays on a celebrity ice hockey team.